It gets hot in Wasco, California in the summertime. And that heat carries over into Autumn. But eventually, the Earth turns its northern half away from the sun and the good Sisters of Saint Francis make sure the hopper windows along the bottom of the north wall of windows are opened. And the cool air can circulate around the classroom of 35 little grade schoolers, all facing east and listening attentively to the world geography lesson. Geography was an important subject to Roman Catholics whose great commission encompasses all of history and the entire world, but actually only 34 were listening. 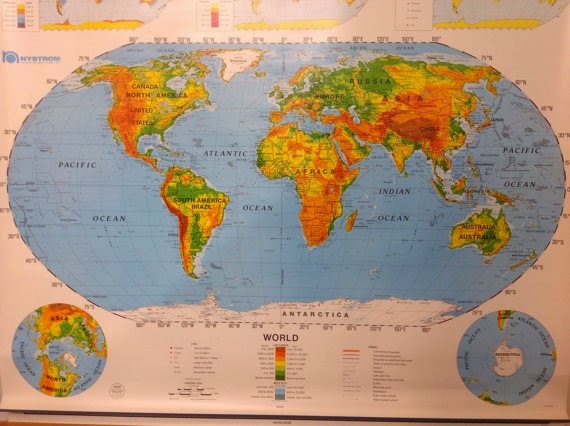 I was enjoying the cool breeze and staring at the world map on the wall and thinking hard, very hard. This was the late 1950’s and we had our share of drills to ensure survival under enemy attack which would come at us over the North Pole. Sisters with first hand knowledge had told us the stories of religious persecution, torture, and death that had happened and continued to happen south of the USA. We all had close relatives that had fought in WWII in the European and Pacific Theaters. Geography. Huh. It was apparent to me the world was a very dangerous place. How could geography help? It took a second world war, but now the USA had been awakened from our dream that the country was protected by friendly neighbors and two oceans. It wasn’t just that our soil had been attacked in minor ways in WWII. Today, better aircraft, rockets, and bombs were being created every day. TV shows and movies were a continual reminder of what bomber aircraft could do to modern industrial nations. We knew rockets fired from Germany to England almost defeated that country, and now rockets could easily reach us. And it wouldn’t take many airplanes or rockets to do real damage if they were carrying the new atomic bombs that were being tested all the time in Nevada. Religious persecution, torture, and death? It was real. We had nuns from those countries or who knew those victims. Are you skeptical? A quick search for Cristero Martyrs should suffice to add to your knowledge if you didn’t get this in your history classes. Many other examples exist. So, pondering all these thoughts, I wondered how we could possibly defend such a large country. It was a hard job, even if we only tried to defend the 48 States and not the newcomers Alaska and Hawaii. And what about all those territories out there in the Pacific Ocean? What a problem! My best solution in my little brain in Grade School was a giant dome of protection across the 48 states. But what could it be made out of? I remember thinking that 30 feet of lead surrounding the USA at a height above commercial aviation would most likely prove impractical. Even if you could dig up that much lead and create such a dome, we’d really have to let the wind and weather through. 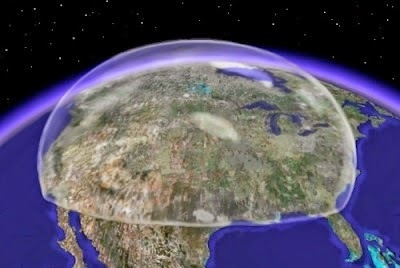 What would such a protective dome look like in reality? I couldn’t get very far in this direction. Over the years, ideas would occur to me. Some kind of surveillance probably? Maybe a way to discourage attacks by being stronger than any other country? But certainly a last line of defense using some kind of futuristic weapon. Fast forward to my career in aerospace and defense. I flew Air Force sorties to ensure we could see the world to the detail needed for protection. I helped keep our missiles on alert to ensure a credible deterrent. And I helped ensure missile-based missile defense moved forward. It still gets hot in the summertime in Wasco, California. I like to think that many other kids in Wasco, and schools across our nation, are still thinking deep thoughts that will someday turn into their life’s work.